Classification of compound steam engine can be defined according to the arrangements of cranks and the angles between them. Compound steam engine has two cylinders.High-pressure cylinder (H.P.) and low-pressure cylinder (L.P.). Classification of compound steam engine is generally three types. But before going to know the different types of compound steam engine, you should read the basic concept of compound steam engine. In tandem type compound steam engine, a common piston rod is attached both high-pressure (H.P.) and low-pressure (L.P.) cylinder chamber. This piston rod works on the same crank, shown in the diagram. At first, pressurized steam coming from boiler enters one side of the high-pressure cylinder.After that, it passes through high-pressure cylinder to low-pressure cylinder and exhaust directly from another side of low-pressure cylinder. 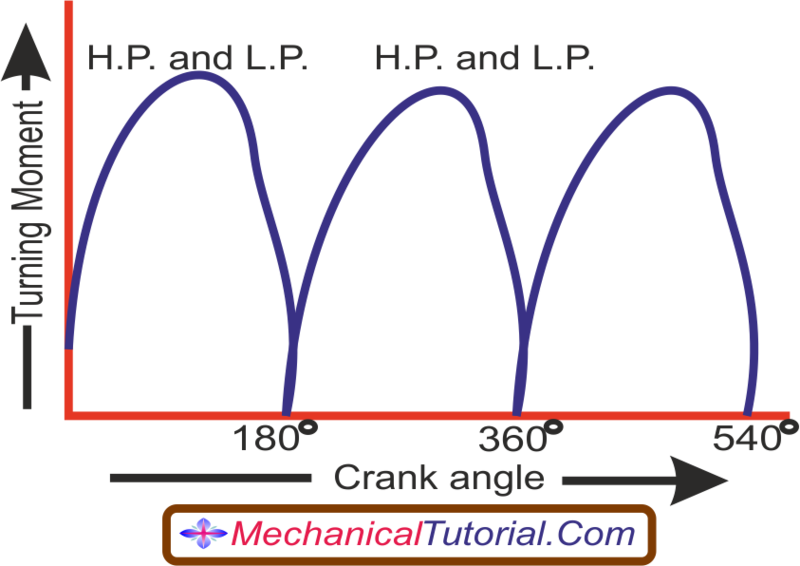 Since piston rod is common for both the cylinders, crank angle is 00 to each other, see in the following graph. The graph shows the turning moment of the crankshaft versus crank angle.Each cycle of the graph are in phase.So, maximum and minimum turning moments on the crankshaft due to each cylinder will act at the same time.This is the big disadvantage of tandem type compound steam engine.To overcome this fluctuation a large flywheel is used. In Woolf type compound steam engine, two different piston rod crank sets are attached with high-pressure and low-pressure cylinders placed 1800 to each other. The cranks are placed in same crankshaft. The graph shows the turning moment on the crankshaft and crank angle.Here the difference between high-pressure and low-pressure cylinders are 1800 apart from each other. Since cranks are 1800 apart, the two cycles are in phase and there is a large variation in the turning moment on the crank shaft.A large flywheel is required to overcome this fluctuation.This is a the big disadvantages of this type of engine. Two different piston rods are attached to high pressure and low-pressure cylinder in receiver type compound steam engine.Piston rods are attached to two different cranks set at 900 to each other.These cranks are attached to the same crank shaft shown in the picture. Now steam is coming from the boiler directly enter to the one side of high-pressure cylinder but can't enter from high-pressure cylinder to the low-pressure cylinder.Because two cranks are set 900 which is out of phase.To enter the steam in low-pressure cylinder, a vessel is placed in between high pressure and low-pressure cylinder, called receiver.The steam from high-pressure cylinder at first enters the receiver and then enter to low-pressure cylinder. 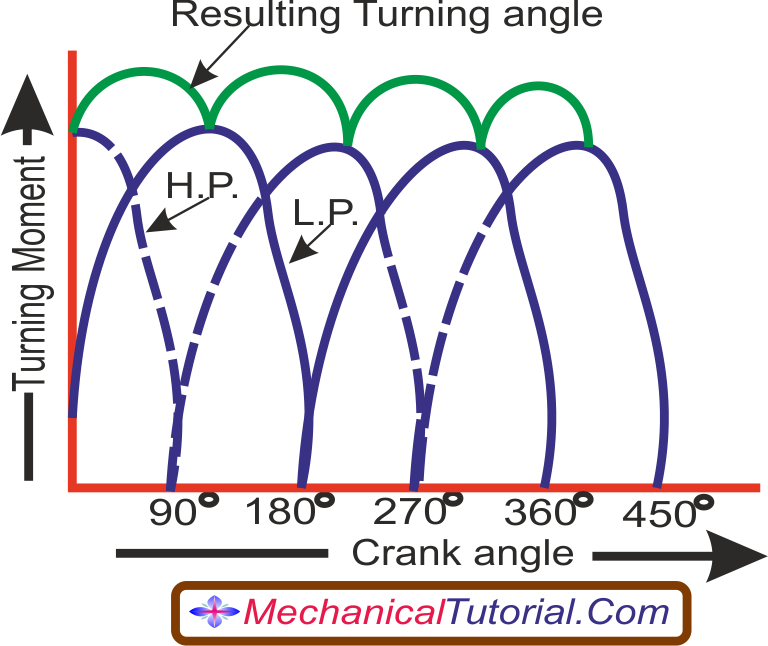 The graph shows the turning moment versus crank angle of receiver type compound steam engine.The cranks are 90 degree apart and two cycles are out of phase by 900.The diagram shows the resulting turning moment.It is observed that the resulting turning moment is reduced by placing the cranks at 900.So lighter flywheel is required for this type of compound steam engine.It is the chief advantage of receiver type compound steam engine.